All the property, totally owned by the family, is cultivated organically and it is managed with care and attention by Alberto Coffele himself, director of production. Giuseppe Coffele, however, is dedicated to the protection and conservation of the land since, as early as the 1970s, he was the first private vine grower of the Soave Classico zone to believe in the Castelcerino crus. They are the highest vineyards in the Soave Classico zone (up to 400 m above sea level) and are located in the northernmost part of the Municipality of Soave. They face south-south-west and there are notable differences between the southern soils (calcareous) and those to the north (basaltic). The former offer to the wines higher acidity, finesse and longevity, while the darker volcanic soils give more body and complexity. The presence of a large woods (the largest within the whole DOC area) influences the micro-climate, softening the excesses of summer heat and therefore allowing the maintenance of good acidity of the grapes. The constant presence of northerly winds keeps the grapes in good health, a boon for the management of an organic vineyard. Divided into two different types of soil, respectively calcareous to the south for the cultivation of Garganega grapes and basaltic for Trebbiano di Soave grapes, the Ca’ Visco cru is the highest vineyard of the Soave Classico DOC area. Ca’ Visco was the first cru to be selected by the winery and its first vintage was in 1992, a consummation of twenty years of work to identify its characteristics, quality and particularities. Very sunny and exposed, Alzari is the cru chosen for Garganega wine expected to undergo ageing. Because of its location and its characteristics, the wine that is obtained is generally more alcoholic. The soil is calcareous and the old vines are traditionally pergola-trained, according to the typical “pergola Veronese” system. Nuj, an age-old name found on old land registry documents to indicate this area, is the cru located in the lower part of the vineyards, at 150 metres above sea level. Formerly given over to red wine grapes in the 1960s (in fact, traces of Merlot vines have been found), it was naturally suited to the production of our classic Bordeaux-style blend. Castel Cerino was the last cru selected by the company. From the 2015 vintage the Coffele Soave Classico has been enhanced by use of its cru name, thus emphasising its provenance and its territorial and qualitative particularities, determined by forty years of experience working in the vineyard, passed down through generations, from Giuseppe to Alberto. In the last fifteen years the production of Coffele wines has spread to the Valpolicella zone, more precisely to the village of Campiano, a small part of Municipality of Cazzano di Tramigna, where four hectares were acquired for the production of a young Valpolicella and an Amarone della Valpolicella. This certification is the result of a twenty-years commitment that, since the arrival in the Estate of Alberto Coffele, has led it to adopt more environmentally friendly methods of cultivation that favour the health of consumers, such as: the abandonment of herbicides, the decision not to use systemic products in order to avoid residues in the final product, the use of earthworms for obtaining humus and compost produced in the farm, to maintain the fertility of the soil. 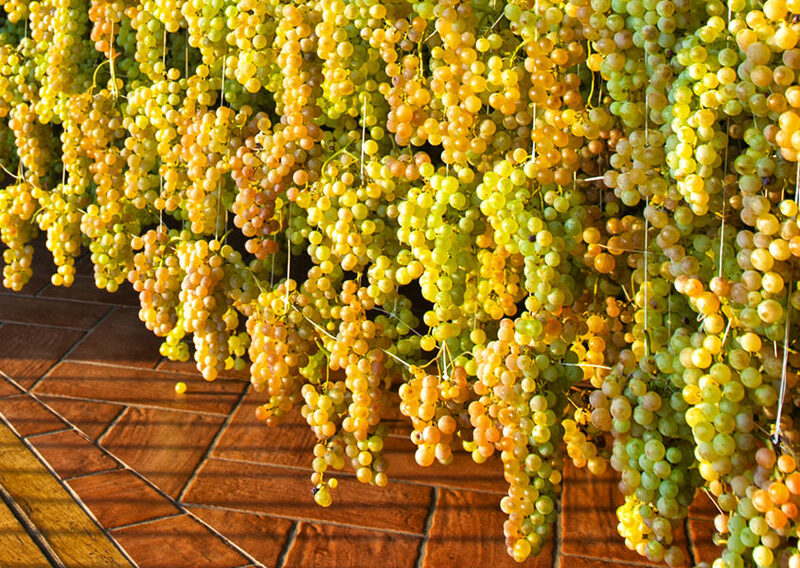 After many years of experimentation, the Coffele family chose to return, the first in the zone, to the ancient system of drying the grapes on vertical framework. This system is much more expensive and requires a lot of space but the result, especially from the point of view of health and concentration of flavours of the grapes, is much superior compared to other drying systems. So in 2003 a new drying room was built, whose minimal detail had been carefully studied. The location was a conscious choice, the drying room is positioned on the banks – “Sponde” – of a hill (properly a ridge) where the fog doesn’t arrive and whereover the years, good ventilation has always been experienced. Taking advantages of these optimal conditions, a software was therefore designed that automatically regulates the opening and closing of the large windows, so that just by the exchange of air the right humidity and temperature inside the drying room are achieved. This allows a more natural drying (and each winter gives its own character to the wine) and significant energy savings, by not using dehumidifiers and air conditioners. Soil fertilization, critical to avoid depleting it over the years, is done exclusively with organic substances produced on the farm, whose source is well known. The horses on the farm feed mainly on forage produced on the farm. It is worth stressing the importance of soil organic matter both for its natural fertility and for its structure (physical aspects). None of the nutrients in the soil are readily assimilated by plants if there is not a good quantity of organic substances. It is provided purely by manure. It should be noted that this very day very few wineries have animals and the techniques of animal breeding is in crises. Therefore it is increasingly more difficult to obtain good quality manure. Above all, the remaining beeders increasingly utilize medicines and hormones for their animals which are inevitably found in their manure. The fact is that it is always advantageous to have direct availability to organic substances produced from breeded animals. The lifespan of organic substance in the terrain is not eternal. It can decompose and become mineralized. No form of agriculture technique can correct this. In the Anglo-Saxon countries biological agriculture is called ‘organic agriculture’, since its founders found in the organic substances the fundamentals of an eco-compatible and a self- sustainable agriculture. Aside from the economic and technical aspects there is also an ethical aspect to consider as synthesized by Bonciarelli : ‘The maintenance of the fertility of the soil of a level not inferior to that which our generation had available is an imperative imposition of ours towards the generations of tomorrow’. 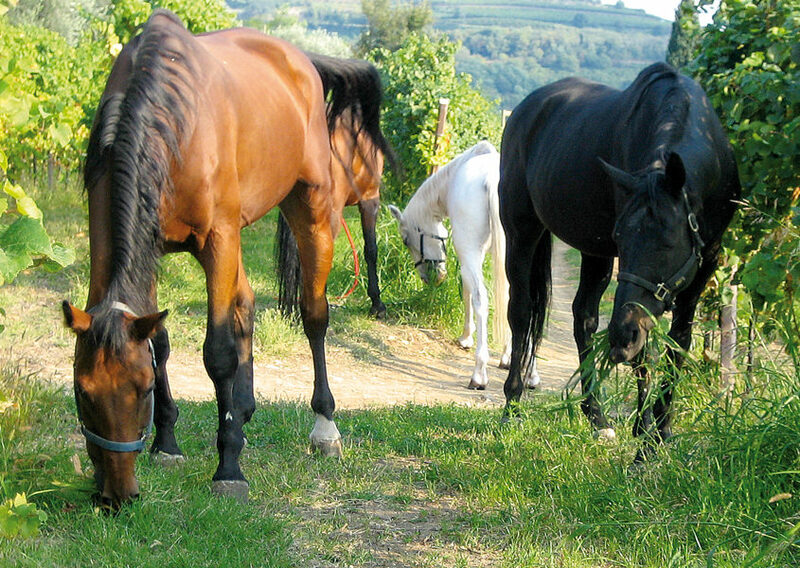 There are several reasons why Alberto Coffele chose to give the horse an active role in the vineyards. Once he selected the right horse for its physical strength and character, the animal can be used in all the jobs in the vineyard. This confers a definite advantage in terms of environmental impact, and ever greater effectiveness and yield from a technical and agronomic point of view. Does not pollute: it does not need fossil fuels to do its work (being fossil fuels one of the main causes of environmental pollution and global warming) and it cannot be charged for noise pollution. It is indeed agreeable to be working outdoor while avoiding the deafening noise of a tractor. Fights weed and nourishes the land in a natural manner: eating, at least in part, fodder produced in the estate and the weed found in the vineyards (in springtime and after the vintage, when there are no traces left of vineyard treatments), horses produce a very good manure, of higher quality than bovine manure, thus closing a complete biological cycle inside the vineyard. Prevents soil from becoming compacted, as it happens when a tractor continuously rides over the land. Small tractors can weigh up to 2 tonnes and ride an elevated number of times in the vineyard, making the land more and more compacted as well as destroying its texture and structure (which is what regulates its chemical and physical proprieties). On the contrary, a horse can weigh 0.8 tonnes on average and it distributes its weight on its hooves, not on the entire larger surface of the wheels as it happens with tractors. Today, soil compacting is slowly and relentlessly destroying the land and its living forms. As an outcome, another mechanical treatment is necessary – deep subsoil treatment for oxygenation – that would not be necessary if the horse was used to work in the vineyard as in the past. Allows many environmental-friendly treatments that, even if more expensive in terms of work-out, can be positively implemented by wineries that are already open to a more eco-sustainable viticulture, aimed at producing higher quality and healthy wines. Finally, with its slow and silent pace, the horse invites you to know the land and the vineyards better, to observe them in a different way, with even more attention for a better interpretation of the terroir: a truer and deeper relationship to better understand every shade of a landscape that will bring upon a great wine.